This class provides an interface for property manipulation: it is used to modify properties that allow you to control values of the logic-related parameters. When a property is assigned to a node, an instanced internal property is created and saved into a .world or .node file. However, rather than the whole list of parameters it contains only the modified ones. The path specifies where the property is stored on the disk. The path includes a property file name. The name specifies how the property will be displayed in the UnigineEditor (the Property Hierarchy window, the nodes surface section of the Parameters window). The name can also be used to refer to a property from the code. By default, the property name and the *.prop file name coincide. By using functions of this class, you can, for example, implement a properties editor. Properties specify the way the object will behave and interact with other objects and the scene environment. A property is a "material" for application logic represented by a set of logic-related parameters. Properties can be used to build components to extend the functionality of nodes. All properties in the project are organized into a hierarchy. To be modified, properties should be obtained from the hierarchy via API functions. Property parameters are managed individually via the PropertyParameter class, to get any parameter by its name or ID you should use the getParameterPtr() method. You can modify only existing parameters of the property. To add or remove new parameters, you should manually edit the .prop file or use API to edit the XML file via the code. The Property class doesn't allow adding a new property to the property hierarchy. To save all properties in the hierarchy that can be saved (i.e., editable, having a path specified, and not internal or manual ones) via the Properties::saveProperties() function. By default, all parameters and states of the inherited property are the same as specified in the parent property. A child property can override some parameters of its parent or add new ones. By editing the corresponding .prop file via API: you can open an XML file, write data into it and save it. The example below shows how to add a callback to track changes of property parameters and report the name of the property and the changed parameter (suppose we have a manual property named my_prop with an integer parameter named my_int_param). View the list of all properties used in the project. View the list of parameters of the currently selected property. Inherited, overridden and unique parameters are displayed in different colors. Change the value of the selected property parameter. Reset the value of the selected property parameter. Inherit a new property from the selected one. Save the currently selected property to a file. custom_prop_0.prop inherited from the custom_prop property. Below is the source code in C++ implementing our Property Viewer. You can copy and paste it to the corresponding files of your project. // System logic, it exists during the application life cycle. // These methods are called right after corresponding system script's (UnigineScript) methods. s = String::format("<font color=ffff00>Type:</font> array "
// Write here code to be called before rendering each render frame. // Write here code to be called on engine shutdown. Returns the child property of the current property. Returns the ID of the property. Returns the GUID of the property. Returns a value indicating if the property is a base property. Sets a value indicating if the property can be edited. Returns a value indicating if the property can be edited. Returns a value indicating if the property is hidden. Returns a value indicating if the property is engine-related (i.e. required for engine operation). Returns a value indicating if the property is	an internal one. Returns a value indicating if the property is a manual one. Returns a value indicating if there are no missing parents in the hierarchy of the property. Sets a new name for the property. Returns the number of children of the current property. Returns a value indicating if the property has at least one overriden parameter. Returns a value indicating if the property with the given name is a parent of this property. Sets the given property as the parent for this property and saves the parameter values of the property (if the corresponding flag is set). Sets a new path for the property. Sets a new GUID for the property file. Returns the current GUID of the property file. Returns a path to the property. Sets the owner flag to 1 for the Property pointer. Releases the Property (sets the owner flag to 0 for the pointer). Inherits a new property from this one. Loads the property from the file specified by the setPath() function. Loads data of the property (all its parameters) from the given instance of the Xml class. Loads data of the current property (all its options, states and parameters) from the given instance of the Xml class. Reloads the property and all its children. Restores the data of the property (all its parameters) from a binary stream in the specified mode. Returns a value indicating if the property can be saved to a file. Saves data of the current property (all its parameters) into a binary stream. Saves the property data to the file specified by the setPath() function. Saves data of the property (all its parameters) to the given instance of the Xml class. Saves data of the current property (all its parameters) into the given instance of the Xml class. Adds a callback of the specified type. Removes the specified callback from the list of callbacks of the specified type. Clears all added callbacks of the specified type. Returns parameter type identifier by the type name specified. Returns parameter type name by the type identifier specified. Returns a property parameter by its name or ID, or a root parameter if neither of them is specified. Returns the number of structures of the property. Returns the number of the structure with the specified name. Returns the name of the structure with the specified number. Type of the property parameter that allows specifying the material color (a vec4 value). Type of the property parameter that allows accepting any double value in a given range. Type of the property parameter that allows accepting float value in a given range. Type of the property parameter that allows accepting any file GUID value. Type of the property parameter that allows accepting any integer value in a given range. Type of the property parameter that allows specifying a mask (an integer value). Type of the property parameter that allows accepting any material GUID value. Type of the property parameter that allows accepting any Node. Type of the property parameter that allows accepting any property GUID value. Type of the property parameter that allows accepting any string value. Type of the property parameter that allows specifying a set of several possible values (more than 2). Type of the property parameter that allows only 2 possible values. Type of the property parameter that allows accepting any vec3 value. Type of the property parameter that allows accepting any vec4 value. Type of the property parameter that allows accepting structures. Type of the property parameter that allows accepting arrays. Property destroy callback. This callback is fired when the property is destroyed. Property parameter changed callback. This callback is fired when the value of any parameter of the property is changed or reset to default. Property reparented callback. This callback is fired when the parent of the property is changed. Property renamed callback. This callback is fired when the name of the property is changed. Property moved callback. This callback is fired when the path of the property is changed. Property reloaded callback. This callback is fired when the property is reloaded. Restore mode, which replaces only unique and overridden values (excluding inherited unchanged values). Restore mode, which replaces only overridden parameter values. Restore mode, which replaces all parameter values. Constructor. Creates a new property instance. int num - The number of the target child property. 1 if the property is a base property; otherwise, 0.
int editable - 1 to make the property editable; 0 to make it read-only. 1 if the property is editable; otherwise, 0. 1 if the property is hidden; otherwise, 0. Returns a value indicating if the property is engine-related (i.e. required for engine operation). Such properties are stored in the core, editor and editor2 folders. 1 if the property is engine-related; otherwise, 0. 1 if the property is internal; otherwise, 0. 1 if the property is manual; otherwise, 0. 1 if there are no missing parents in the hierarchy of the property; otherwise, 0. This method is not available for manual and non-editable properties. const char * name - Name of the property. If the property is internal and has a parent, the parent's name will be returned. 1 if the property has at least one overriden parameter; otherwise, 0. Parent property if it exists; if the current property has no parent, nullptr will be returned. const char * name - Parent property name. 1 if the property with the given name is a parent of this property; otherwise, 0. Returns a value indicating if the property with the given GUID is a parent of this property. const UGUID & guid - Parent property GUID. 1 if the property with the given GUID is a parent of this property; otherwise, 0. The method is not available for manual and non-editable properties. const Ptr<Property> & property - Property to be set as the parent for this property. int save_all_values - Flag indicating if parameter values of the property will be saved after reparenting. 1 if the given property was successfully set as the parent for this property; otherwise, 0.
const char * path - New path to the property file. const UGUID & fileguid - New GUID for the property file. GUID of the property file. Clones the property. 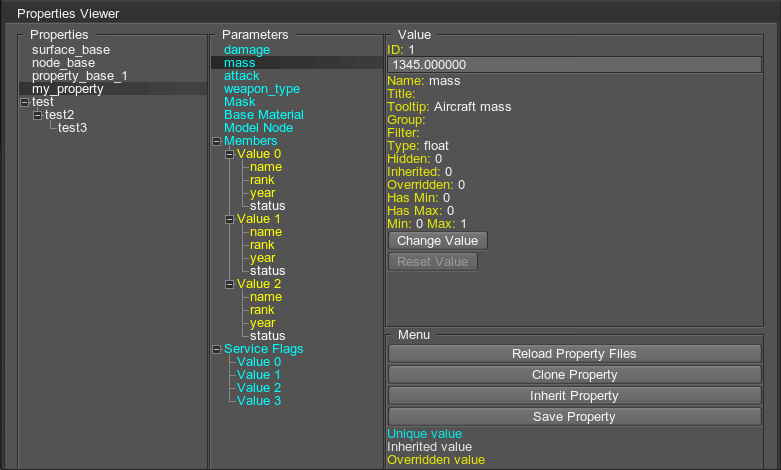 The cloned property won't have a name, a path and won't be displayed in the properties hierarchy. Clones the property and assigns the specified name and path to the clone. The cloned property will be saved to the specified path on saveProperties() call. This method may be used, for example, to create a property missed during project's migration. const char * name - Cloned property name. const char * path - Path to save the cloned property. Clones the property and assigns the specified name, GUID and path to the clone. The cloned property will be saved to the specified path on saveProperties() call. This method may be used, for example, to create a property missed during project's migration. const UGUID & guid - Cloned property GUID. Returns the owner flag. If the pointer is the owner, on its deletion the property also will be deleted. Use grab() and release() functions to change ownership. Releases the Property (sets the owner flag to 0 for the pointer). The Property should be handled by the class after this function is called. Inherits a new property from this one. The inherited property will be empty: it won't have a name, a path and won't be displayed in the properties hierarchy. Inherits a new property from this one and assigns the specified name to it. const char * name - Inherited property name. Inherits a new property from this one and assigns the specified name and path to it. The inherited property will be saved to the specified path on saveProperties() call. const char * path - Path to save the inherited property. Inherits a new property from this one and assigns the specified name, GUID and path to it. The inherited property will be saved to the specified path on saveProperties() call. const UGUID & guid - Inherited property GUID. This function can be used to load properties created during application execution or stored outside the data directory. 1 if the property data is loaded successfully; otherwise, 0. Loads the property from the specified *.prop file. const char * path - Path to the *.prop file to load the property data from. const Ptr<Xml> & xml - Xml class instance in which the property data is stored. 1 if the property is reloaded successfully; otherwise, 0. Returns a value indicating if the property can be saved to a file. For example, this function will return 0 for an internal or manual property. 1 if the property can be saved to a file; otherwise, 0.
const Ptr<Stream> & stream - Stream into which the property data will be saved. 1 if the property data is saved successfully; otherwise, 0. This method is not available for manual and internal properties. Saves the property data to the specified *.prop file. This method is not available for manual properties. const char * path - Path to the *.prop file to save the property data to. const Ptr<Xml> & xml - Xml class instance into which the property data will be saved. int force - A value indicating if forced saving of property data is used: 1 to enable forced saving, 0 to disable it. Unigine::CallbackBase1< Ptr<Property> > * func - Callback pointer. Unigine::CallbackBase2< Ptr<Property>, int > * func - Callback pointer. Removes the specified callback from the list of callbacks of the specified type. Callback functions can be used to determine actions to be performed when any changes to the property are made. Clears all added callbacks of the specified type. Callback functions can be used to determine actions to be performed when any changes to the property are made. const char * param_type - Parameter type name. Parameter type identifier, one of the PARAMETER_* variables. int param_type - Parameter type identifier, one of the PARAMETER_* variables. Returns the root property parameter. Root property parameter smart pointer. Returns a property parameter by its name. const char * name - Property parameter name. // getting some property named "my_property"
// trying to get a property parameter named "some_parameter"
Returns a property parameter by its ID. int id - Property parameter ID. Number of structures of the property. const char * name - Name of the structure to be found. Number of the structure with the specified name, if it exists; otherwise, -1.
int num - Structure number. Structure name, if such structure exists, otherwise nullptr.